AHDB analyst Bethan Wilkins said: “Full year data is not yet available for the key Southern European states. Reports from Italy indicate that household purchases of pig meat (year to September) declined nearly 1%, although higher prices meant market value still increased. Meanwhile, fresh pork sales in Spain fell nearly 2%, despite lower prices, in the year to October. “However, processed meat did record a small (+1%) increase in volume and value. 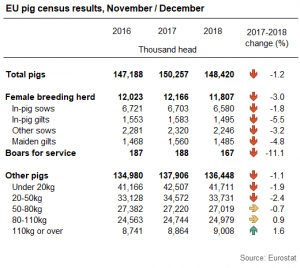 The overall EU pig herd decreased to 148 million head in the year to December 2018, according to provisional figures from Eurostat. Most of this decline was due to a 4% fall in the German pig herd, alongside 7% fewer pigs in Poland. Pig numbers also fell in Denmark, but to a lesser extent. Hannah Clarke, AHDB’s trainee analyst, said: “The number of female breeding pigs declined by 360,000 head (almost 3%), with a particularly noticeable drop in pig gilts. Breeding sow herds in the majority of the biggest producing countries fell, with Poland recording the largest decline (-164,000 head) followed by the Netherlands (-96,000 head).